New York City’s bike share program is flourishing, and I recently signed up for a membership even though I live outside the range of any Citibike stations. I find it convenient and fun to use the bikes to cross town, as well as zip from place to place when I am downtown. Since my first ride on the Parisian Vélib’, I’ve become a huge fan of bike shares, and have enjoyed rides in Paris, DC, Denver, Miami, and Toronto. The other month I had a great conversation with a local bike shop owner about the new program, and he conveyed the anxiety that many bike shops are feeling around Citibike. Understandably, many are concerned that the bike share will cut into their rental and retail sales, although I think it is likely that an increase in biking will generate more interest and awareness, and generally increase the demand for bikes and bike services. Our discussion helped me recognize was how the city bike shares can be viewed as a platform for innovation, in the same sense that the iPod/iPhone is platform. And, just as the iphone-as-platform enabled a large ecology third-party hardware and software businesses, bike shares present an analogous opportunity to creative entrepreneurs. Platforms can support entire ecosystem, and city bike shares provide an opportunity to build a new ecosystem around them. Let’s start with the hardware. I don’t need an MBA to understand that the real money in retail is made by selling accessories. For the iPhone this includes cases, cables, and a range of other devices, but retailers like Amazon and Best Buy have invested in incredibly complex systems to track the relations between products and their compatible accessories. Consider this. What New Yorker wants to be mistaken for a tourist while riding their Citibike? What they need is a way to (fashionably) express themselves, and make the generic bike their own. Starting with an appropriate pannier bag, Citibikers need an easy way to transport their helmet, gloves, music, and personal belongings. Bike shops currently have entire walls devoted to these kinds of accessories. With some focused curation bike shops can begin assembling “MyCitiBike” kits that are segmented and suitable for the demographics of their customers, no custom manufacturing required. Bags and accessories are just the start. Helmets should be as ubiquitous as umbrellas—inexpensive ones sold by street vendors, and maybe more durable ones available in vending machines, for a refundable deposit. You would just need to bring your own liner, which you could conveniently stash in your pannier bag. Consider the explosive proliferation of bike lights that are poised to transform New York City into Black Rock City. Bike lights are being sold in increasingly dizzying arrays of frequencies and patterns, but the arms race for visibility and attention may soon devolve into visual noise and distraction as the density of bikers grows. Imagine you are a biker who wants to communicate your intentions to a motor vehicle. During the day, there is a system of hand signals for signaling your intent. But currently are are’t any well established standards for bike lights, other than white in the front and red in the back. Some of the standards that could help are obvious—more red when I’m braking, and left and right blinkers when I’m turning. Others, like wireless control of helmet mounted lights, still need to be worked out. Some European bike manufacturers have begun introducing signaling innovations, but without standards these efforts will likely stall. Standards can emerge from the top-down, by mandate or regulation, or the bottom-up, by convention and adoption. I believe that bike share fleets present a powerful opportunity to innovate on bike safety and standards in a way that could lead the rest of the market. Admittedly, it would be difficult to convince municipalities to devote the resources to underwrite these features. However, I dream of a day when stakeholders such as Transportation Alternatives and Critical Mass work with the Mayor’s office to hold Citibank’s feet to the fire. Instead of just a marketing campaign designed to whitewash their reputation, the Citibike program could be used to spearhead safety initiatives, such as lighting standards and open APIs, that could eventually make their way across the rest of the biking industry. The iPhone has the app store, and bikeshare apps could be just as expansive. From quantifying yourself for fitness and health, to turning the city into one big arcade game, the possibilities are really wide open. It’s easy to imagine apps which bring traditional “pedal-for-charity” campaigns into 21st century, as well as casual team games like capture the flag or even frogger. Some of these games could be powered by apps that run on smartphones, or fitness trackers (e.g. fitbit), but once again, the bike-share platform offers an opportunity to standardize data formats and open apis for ride tracking. RiderState is an early example of a competitive social game for bikers, but more will surely follow. It’s an exciting time for cyclers. 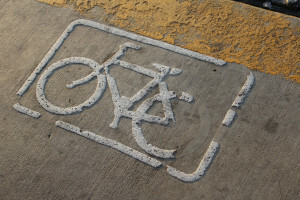 US cities are finally embracing bike lanes and bike shares are spreading across the country. Bike safety continues to be a pressing issue, as projects like crashmapper vividly demonstrate. Creativity is spinning around gorgeous projects like Monkey Electric, and revolights brings brakelights to your wheels. There is a huge opportunity to coordinate some of this activity around platforms like the Bixi bike, and build a thriving ecosystem around bike shares.